The Jersey Shore as a whole offers an excellent lifestyle for homeowners and vacationers alike. Amongst the multitude of shoreline towns is a family favorite, Ocean City. If you've landed in Ocean City, but need extra guidance on the specific spot, explore our site for neighborhood details. Here’s the lowdown on one of Ocean City’s eight main neighborhoods, The Gardens. If you are looking for the family-oriented fun that Ocean City, NJ brings without being in the center of it all, The Gardens is likely the right spot for you. This northernmost tip of Ocean City is a high-end community and primarily residential while just one-mile from top attractions such as the famous Gillian’s Wonderland Pier. Both as a vacation home and all year-round, there is plenty to enjoy in this upscale area. Let our team of Ocean City realtors help you get to know it! With equal exposure to the beach and the bay, you have your pick of waterfront property when it comes to The Gardens. Regardless of what you choose, the wide range of home types available will likely give you a great view and a nice size yard. Therefore, you can’t go wrong, even with a non-waterfront property! Windy roads make it feel unique compared to the rest of Ocean City and the beautiful single-family homes you’ll find amongst them make it feel like a hidden gem. The Gardens single-family homes average price is just over $1,200,000. Be sure to ask our Ocean City Property team for up to date information and for the exact number of homes available for sale during your real estate hunt in The Gardens. One thing is for sure, The Gardens is a great investment for you and your family due to the strong resale value of the homes in this well-established community. There are eight great neighborhoods to choose from in Ocean City but we are certain you will not be disappointed when you choose to buy a home in the exclusive gardens. Are you looking for homes for sale in the Gardens of Ocean City NJ? Then click on the map above to view all homes in The Gardens. Sailing, golfing and even a book club are all available at the Yacht Club nearby. With beautiful views of the bay and a calendar full of events and entertainment, the Yacht Club is a perfect extension of your Ocean City home. Exclusive to The Gardens area is an additional beachfront with beach access parking. Drive by for a sunset on your way home or take a nice stroll to dip your toes in the sand. This is a perfect pit stop on your way north to enjoy other Jersey Shore beaches. Up for a little gambling? Atlantic City is over the Longport Bridge only about 11 miles to the north. If quiet and quaint but close to the hustle and bustle sounds like your gig, The Gardens of Ocean City, New Jersey is bound to be the perfect place for you. No need to begin your search alone. The Ocean City Property team is dedicated and prepared to help get you there! 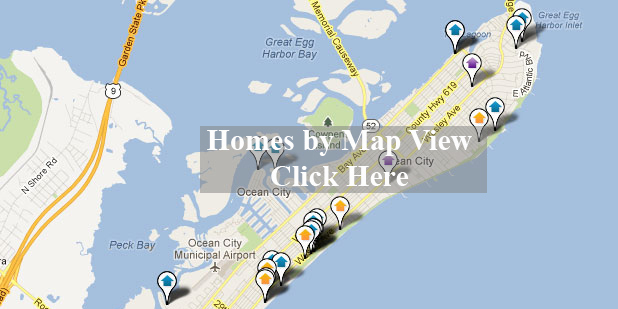 Homes for sale in the Gardens of Ocean City is our specialty. Above are just a few of the newest Gardens homes to hit the market. The site is easy to use for all your property search needs.